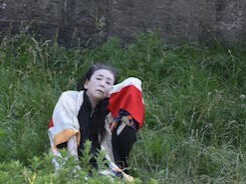 As part of the 2016 River To River Festival, Eiko presented the video installation A Body with Water on June 18th, 19th, and 25th in Nolan Park, House 20B on Governors Island. 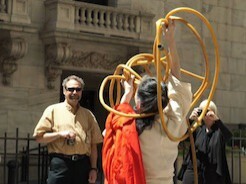 Videos were selected and edited from footage of Eiko's recent performances of A Body in Places including Hong Kong, Durham, NC (American Dance Festival), Martha's Vineyard (the Yard), Burlington, VT (Flynn Center), New York (Danspace Project's Platform), Miami (TigerTail Production) and Middletown, CT (Wesleyan University). 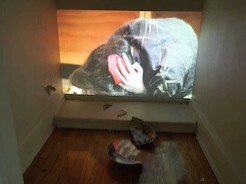 All videos are connected by the presence of water, whether it is an ocean or a small bowl. Many friends, colleagues, and passersby visited the installation during the week it was on view. Many were surprised to discover videos in unexpected corners of the abandoned house, lingering in a closet, kitchen, and stairway. 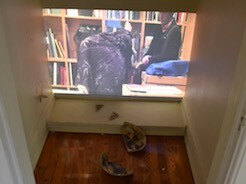 One visitor commented that the videos reminded him of "a combination of Kenzaburo Oe and Ingmar Bergman!" Watch a virtual tour of the installation and see photos.